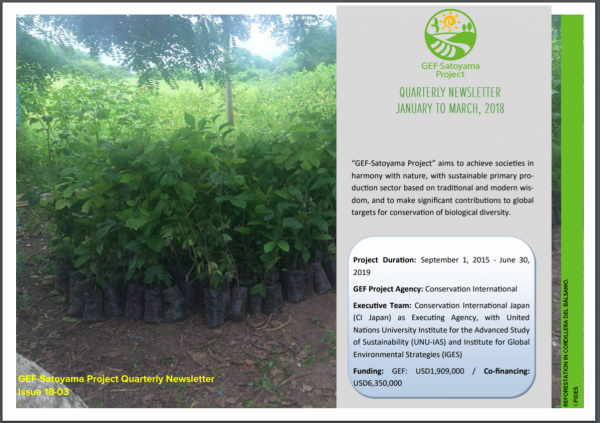 This month’s newsletter introduces the new Director of the IPSI Secretariat, and provides reports from recent events at CBD SBSTTA-22 and SBI-2 in Canada and ISAP 2018 in Japan. We have a number of new knowledge products to share with readers, including a new publication from the COMDEKS Programme, a report from our recent workshop on integrated landscape approaches and NBSAPs, and Spanish versions of the recent videos on the “Indicators of Resilience in SEPLS”, plus newsletters from both the COMDEKS Programme and the GEF-Satoyama Project. We are also happy to introduce one of our newest members, the Policy for Sustainability Lab of the Faculty of Social Sciences at The University of Hong Kong. A new Director of the IPSI Secretariat was appointed on 1 July 2018. We hope you will join us in welcoming Mr. Hiroaki Takiguchi to his new position, as we look forward to further developing the partnership and its activities under his leadership. Mr. Takiguchi has served with the Ministry of the Environment, Government of Japan (MOEJ), for over 20 years, where he served as Director for Environmental Health and Safety Division from 2017 to 2018, overseeing and providing strategic, policy and technical guidance on hazardous chemicals management. From 2011 to 2014, he worked as a Senior Environmental Specialist at the Global Environment Facility (GEF) Secretariat in Washington DC, where he worked on the focal area of sustainable transport for climate change mitigation as well as that of hazardous chemicals management. He is a Japanese national with a Doctor of Engineering from the University of Tokyo. We would also like to take this opportunity to thank the outgoing Director, Mr. Naoya Tsukamoto, for his years of hard work on behalf of the partnership. The Convention on Biological Diversity (CBD) held the Twenty-second Meeting of the Subsidiary Body on Scientific, Technical and Technological Advice (SBSTTA-22)from 2-7 July and the Second Meeting of the Subsidiary Body on Implementation (SBI-2) from 9-13 July 2018 in Montreal, Canada. In addition to the serious negotiations on topics related to the CBD, three side events were held related to the IPSI Secretariat. “Can a landscape approach bridge livelihood, science, and conservation? 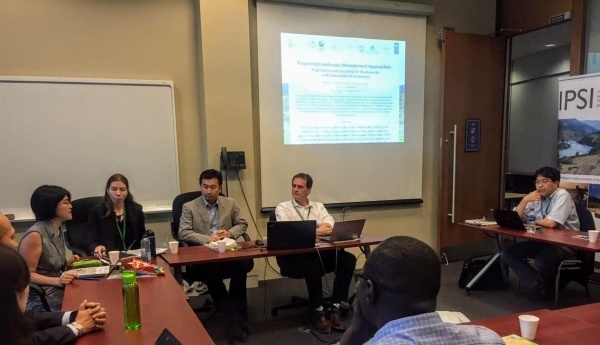 The Satoyama Initiative and the science-policy interface”, was held on 5 July, organized by the United Nations University Institute for the Advanced Study of Sustainability (UNU-IAS, which hosts the IPSI Secretariat) with the Ministry of the Environment of Japan and the Ghana National Biodiversity Committee. The event provided a chance for the Secretariat to give updates on progress and future plans for the partnership, and for other experts to discuss activities related to multiple knowledge systems, the Intergovernmental Science-Policy Platform on Biodiversity and Ecosystem Services (IPBES), and community-based monitoring and information systems. “Financing Landscape Management Approaches: Replication and Upscaling for Biodiversity and Sustainable Development” was held on 10 July by UNDP with the IPSI Secretariat and Conservation International, with presentations on funding mechanisms and sustainable financing under IPSI and the Satoyama Initiative, including the Satoyama Development Mechanism (SDM), the COMDEKS Programme and the GEF-Satoyama Project. “Mainstreaming Biodiversity in Production Landscapes and Seascapes: Integrated Approaches in Design and Implementation of National Biodiversity Strategies and Action Plans (NBSAPs)” was held on 12 July, organized by UNU-IAS, the Secretariat of the CBD, the Ministry of the Environment of Japan, and the Ministry of the Environment of Estonia. This event was about the IPSI collaborative activity research project “Research on development and implementation of National Biodiversity Strategy and Action Plans (NBSAPs) toward realization of societies in harmony with nature“, with presentations introducing the project and explaining different countries’ experiences with SEPLS-related approaches in national policymaking and implementation. 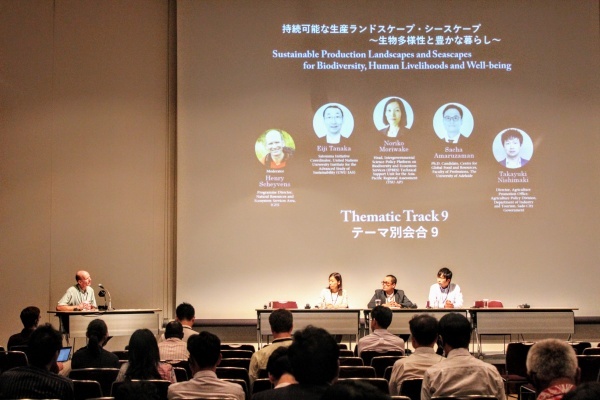 The IPSI Secretariat at the United Nations University Institute for Advanced Studies (UNU-IAS) organized a thematic track session on “Sustainable production landscapes and seascapes for biodiversity, human livelihoods and well-being” during the Tenth International Forum for Sustainable Asia and the Pacific (ISAP 2018), on Thursday, 19 July 2018 in Yokohama, Japan. The session introduced key messages from the IPBES Regional Assessment for Asia and the Pacific released in March this year, which notes that sustainable production activities pursued in harmony with nature are essential to achieve the Sustainable Development Goals. The session then presented case studies from IPSI members to demonstrate sustainable agro-ecological practices that effectively create mutual benefits for people and nature in production landscapes, as well as findings from volume 3 of the “Satoyama Initiative Thematic Review” on sustainable livelihoods in socio-ecological production landscapes and seascapes. For a more information on the session, please see the IPSI website here. 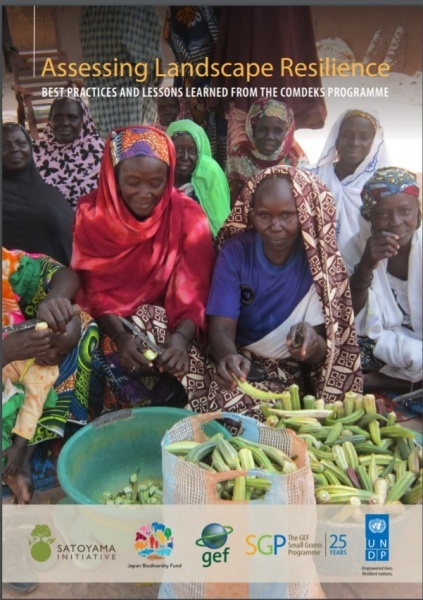 IPSI member the United Nations Development Programme (UNDP) recently published a report titled “Assessing Landscape Resilience: Best Practices and Lessons Learned from the COMDEKS Programme” as an output from the COMDEKS Programme, an IPSI collaborative activity. According to the announcement, the aim of this publication is to summarize the key lessons learned and illustrate the best practices drawn from the practical applications of the “Indicators of Resilience in Socio-ecological Production Landscapes and Seascapes”, which were produced as a result of IPSI collaborative activities, and other allied tools for community consultation during more than five years of field experience. This report is the conclusion of a desk review and a stock taking exercise of all documents—qualitative and quantitative—produced by country programmes about their indicator-related experiences. It intends to contribute to the growing body of evidence-based literature describing the practice of participatory monitoring using indicators and related tools, and documenting its importance in community consultation, education, and mobilization. The publication is available for download from the COMDEKS website here. This workshop was part of an IPSI collaborative activity that UNU-IAS and UT-IR3S, in cooperation with the Secretariat of the CBD, have conducted since 2016, focusing on integrated approaches in production landscapes and seascapes, with a view to assessing the extent to which such approaches have been included in CBD Party countries’ National Biodiversity Strategies and Action Plans (NBSAPs) and their implementation. • “Guardianes del Bosque Seco Ecuatoriano: Una historia de resiliencia comunitaria” (English version: “The guardians of Ecuador’s dry forest: A story of community resilience“), a documentary about the community of Agua Blanca in Ecuador, the situation of the community and its SEPLS, and the application of the Indicators in an assessment workshop. • “Indicadores de Biodiversidad y Resiliencia” (English version: “Biodiversity and Resilience Indicators: Communities managing production landscapes and seascapes“), an instructional video containing background explanations and advice for application of the Indicators through assessment workshops in communities. These videos were produced as a result of assessment workshops held as part of the GEF-Satoyama Project, an IPSI collaborative activity. Please see the IPSI website here for these and other videos. 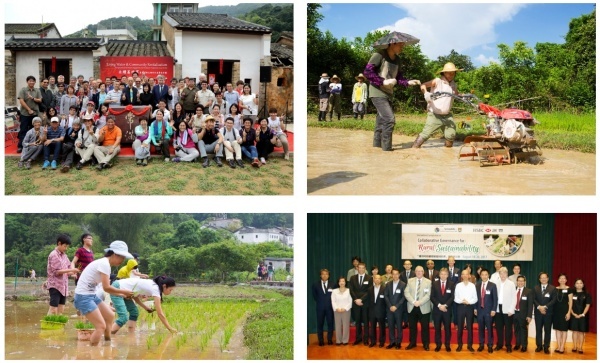 The GEF-Satoyama Project recently produced its seventh quarterly newsletter, including updates from project components and a report on the 2018 GEF SGP China Workshop on Capacity Building for NGOs and Landscape Approach. The mission of the Policy for Sustainability Lab (PSL) of the Faculty of Social Sciences at The University of Hong Kong is to contribute to the attainment of sustainability through forging evidence-based, innovative solutions to inform policy deliberation and action, to raise people’s awareness of the importance of sustainability, to facilitate collective action in and across sectors, and to foster stakeholder engagement. Their projects cover a wide range of sustainability topics addressing the 17 UN Sustainable Development Goals at the local, regional and international levels. For more information, see the PSL website here.